Kris Holm Percussion is the first armor designed to meet the specific demands of unicyclists offering a fitted, flexible, lightweight and cool design through the use of durable 1100 denier Ballistics Nylon. Warning: use of this equipment does not guarantee protection from injury. Ride within your limits! Full coverage to both the front and back of the leg. Inside-knee protection is on the strap, not the armour, so it doesn’t interfere with knee flex. 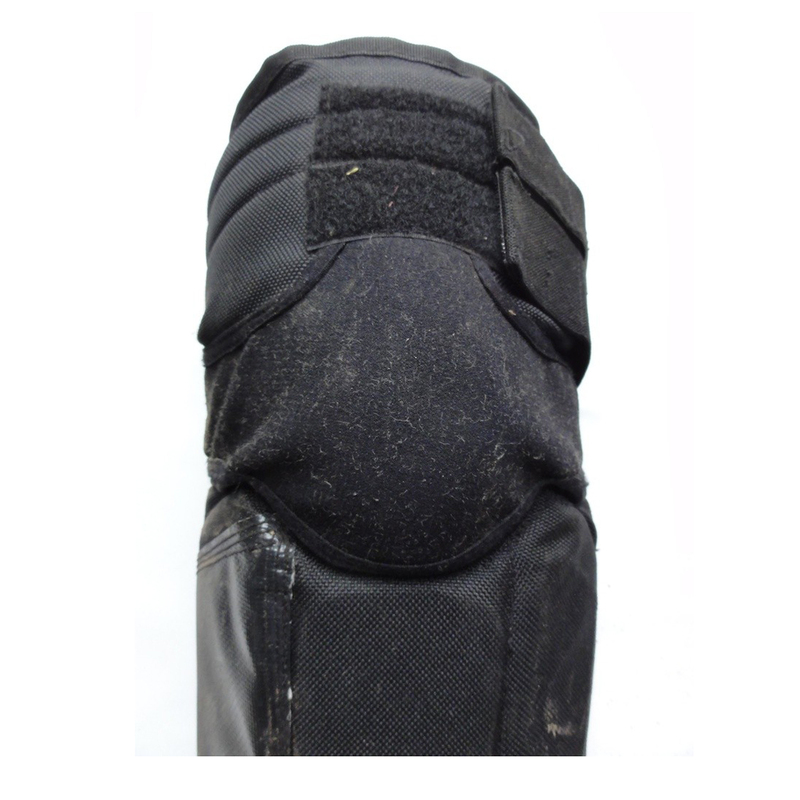 Full abrasion protection around the inside and rear leg, with ventilation behind the knee. Hard shell knee protection is low profile with knee straps wrapping from the inside to the outside to avoid catching on the fork crown. Armor extends fully to the ankle joint, supporting the armour all the way to the knees without requiring restrictive straps at the knee joint. Durable 1100 denier Ballistics Nylon. Lightweight, cool and well-vented behind the knee. Quick and easy to take on/off. The chart below shows a general guide based on your height. In reality, size preference will vary based on personal leg length. Washing Instructions: Kris Holm Percussion Armor is best washed by hand or in a front-load washer. Do up all velcro before washing in a front-load washer. Putting the armor in the original mesh bag you bought it in will help preserve the armor in a washing machine. Do not wash with other articles that could become stuck to the armor velcro. Do not wash in a top-load washer. Do not use bleach. I know that I am going to fall! Often. The question is just when, and how? Shin pads are therefore probably the first item (after a Uni and helmet) to buy! And nothing can beat the KH shin pads. They protect not only the front, but also the back of one’s legs, which is vital as the pedals sometimes hit one from the back. They also come with built in knee guards which I have often used. In addition to all of this, they are very well padded and vented.